Graham Fellows was born and raised in Sheffield and shares his birthday with Mancunian neighbour, Morrissey. Both were born exactly 100 years before Sherlock Holmes creator, Sir Arthur Conan Doyle, and 13 years after footballer George Best. Graham first achieved public notoriety in 1961 when a photo of him (taken by his father, Derek - a professional photographer) won a national baby photo competition, and - more importantly - a family sized fridge; a rare commodity in those days. Graham's first serious musical composition was called 'Miller', written at the age of 7 on the piano. It goes like this..
Miller, miller, can I buy your bags of flour? I've always wanted to know, know, know, know, know..
Then at the age of 11, Graham and schoolfriend Peter Beecroft rewrote the lyrics of the Scaffold's 'Lily the Pink' to commemorate the launch of the decimal currency. Following a performance by the Nether Green School choir at the Summer concert of 1970, the song was aired on Radio Sheffield, and committed to vinyl (limited release!). You might not have made much of 'Miller', but if you know the tune to Lily The Pink you can definitely sing this one..
Graham attended King Edward Vll Comprehensive School in Sheffield from September 1970 to the Summer of 77. He played rugby for the school team but disliked getting bumped into by rough boys, so by the 4th year had given it up for table tennis (YMCA F Team!) and appearing in school plays. These included Billy Liar in the title role, and Hobson's Choice (see below - Albert Prosser is on the back row, 4th from the right). On the road to their chosen career? Graham used to support Sheffield United football team, and regularly attended home matches. After one game he was walking along the road amongst a large group of home fans chanting "United! United!" (in a reasonably restrained manner), when a policeman prodded him in the back and said "Oi you, shut up!" The incident traumatised the wimpy young fan to such a degree that Graham immediately lost interest in football and began spending his weekends creating sound effects on an old reel to reel tape recorder, usually with a bag of Nuttals Mintoes by his side. Graham also kept mice in his attic and exhibited them at mouse shows, mainly in the company of elderly Northern men who rarely got excited by anything, even their mice winning 'Best In Show'! The Summer of 75 was spent working as a builder's labourer, and Graham later worked behind a bar at the Crookes Working Men's Club where the punters would watch carefully as he pulled a pint before criticizing the size of its head. Graham maintains that his overexposure to 'steady yet obsessive' northern blokes was to help shape the creation of the character John Shuttleworth some 10 years later. In the Summer of 76 Graham attended the Manchester Youth Theatre where he learned how to wear tights (borrowed from 'It Ain't Half Hot, Mum' regular, Kenneth MacDonald), when he played Trinculo in Shakespeare's The Tempest. The following Summer (having left school with 3 A Levels, including a 'C' in General Studies), Graham returned to the Manchester Youth Theatre where - with an ear freshly pierced, and looking like the part time punk rocker he was - he finally discovered how to make girls like him. You just sat cross legged rolling a fag on your Rizla machine and girls would come up and say, "Oo,that's clever, could you roll me one?" 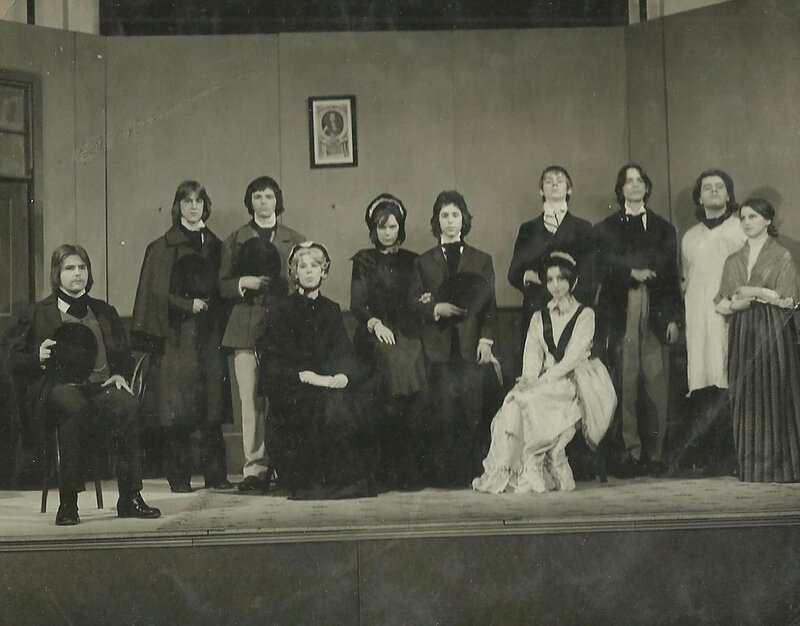 In the Autumn of 77 Graham enrolled at the Polytechnic's School of Theatre (previous students included Julie Walters, David Threlfall and Richard Griffiths) and soon got fed up of wearing tights and pretending to be a wave. He preferred operating the sound desk and tape machine for a final year production of The Roses Of Eyam, further fuelling his love of audio. Graham also learnt how to play the guitar to a very basic level and one day in the college canteen picked up a battered old acoustic guitar lying around and tuned it to an open chord. By placing his finger across all the frets he was able to write 'Jilted John' in his lunch break, which became a major hit single. It defined the sound of Summer 1978 for millions, and by September had reached number 4 in the UK charts. Incidentally, the song was a complete fabrication. There was no Julie. But Gordon just happens to (almost) rhyme with "moron" - otherwise it probably would have been "Gary" instead. Graham apologises unreservedly to all Gordons whose lives have been adversely affected by the song. Graham appeared on Top Of The Pops three times singing 'Jilted John', but didn't particularly relish his pop star status, (apart from being photographed kissing Debbie Harry in the BBC after one TOTP recording), and was glad to return to Manchester Polytechnic in the Autumn to continue his dramatic studies. Although he didn't really enjoy those either. After skiving off rehearsals for a Greek play which required all the performers to wear a papier mache mask and loincloth, Graham received a warning letter from the college principal for "repeated absenteeism". His days as a classical actor were numbered. One evening, a man burst unannounced into Graham's Manchester bedsit - it was Jazz singer George Melly, who insisted "You must come to a party across the road, and come now, Jilted Johnny!" Excitedly Graham obliged, and was soon sitting at the feet of the great raconteur while George spent the whole evening telling the hushed guests his complete life story. Graham distinctly remembers not being asked about his at any point which was a shame as he wanted to mention kissing Debbie Harry and stopping a bus for Sebastian Coe. Eventually, Graham got up and left the party in disgust, having not opened his mouth once since arriving (apart from to shovel food and drink down his throat!). In 1980, after two follow up Jilted John releases had flopped, Graham released a final single for EMI under his own name - 'Men of Oats and Creosote'. It was half sung and half spoken in the persona of an old Northern mouse breeder, and too strange for the UK listening public to ever be a hit. But it was a clue that Graham had a yen to perform as an older Northern man - the type he had encountered in his teenage years working behind the bar and at mouse shows. The seeds of John Shuttleworth had been sown..
Graham graduated from Drama School in 1980 with a Diploma In Theatre and went straight into a year of acting in Rep at Manchester's Contact Theatre. Five years later, Graham was an out of work actor, (but a respected theatrical landlord). Indeed, an up and coming actor called Mark Rylance lived in Graham's spare bedroom in his house in Didsbury for several months around that time. One day, the two men went to Tescos and bought a frozen chicken, a packet of bread sauce and all the other trimmings required to make a traditional Sunday roast. The incident is lovingly recounted in Graham's new song 'Mark Rylance Was My Lodger'. Despite playing the lead in Granada TV musical Visiting Day, appearing on Coronation Street in two different guises in 79 and again in 83 (remarkably both characters were infatuated with Gail Tilsley! ), playing various TV roles throughout the early 80's, and acting in theatres (most notably as Paul McCartney in the musical, 'Lennon' at the Liverpool Everyman), Graham discovered his heart was not really in acting, and he let his subscription to 'Stage And TV Today' lapse. With no major recording contract, Graham released only two singles from 1980 to 85: 'Through The Line', released on Graham's own Toadstool Records - a pretentious (Scott Walkeresque) power ballad which nevertheless was made 'Single of the Week' by Janice Long on Radio 1 - and 'Some Boys', released under the band name Going Red on Razz Records. Featuring Chris Seivey (AKA Frank Sidebottom) on guitar, 'Some Boys' and its B side, a heavy rock pastiche called 'I Tune Kevin's Strings' were performed on the first series of BBC's The Oxford Road Show (the first 'yoof ' TV show to feature scaffolding!). Indeed, Graham performed a song a week throughout the first series. They included a strange and rather silly ditty called 'The Church Disco' which was deemed blasphemous by at least one viewer, as the following week a letter of complaint arrived from Mary Whitehouse herself. Throughout 84 and early 85 Graham wrote, recorded, produced and released (on his own Wicked Frog label) a collection of carefully crafted indie-pop love songs, Love At The Hacienda. The LP was engineered and co-produced by Steve Hopkins (the keyboard player on Jilted John's True Love Stories) and although not a commercial success, the LP has - like True Love Stories - enjoyed enduring cult status. Copies of the rare vinyl version of Hacienda are highly sought after, especially in Japan, and have been known to sell for in excess of £150 (both LPs are to be reissued in 2018 on Boss Tuneage Records). At the time, Hacienda earned Graham an appearance on Granada TV's So It Goes, a kids' music TV show. Graham was contracted to sing 'Where's Carol?' - a song which warns of the dangers of heroin abuse - but the show's producers suddenly decided the subject matter was not suitable for young viewers, and instead insisted Graham perform 'Seven Pints and a Suicide', a song which celebrates alcohol abuse and hot curry overindulgence! The TV appearance was shot whilst Graham rode in a small children's roller coaster at Alton Towers Theme Park and there he met Prefab Sprout's Paddy Macaloon, of whom Graham was and remains a huge admirer. (The two men bumped into each other again in August 2017 in a working men's club in Whitely Bay - in the toilets, as it happens - though initially Graham didn't recognise Paddy as he now sports a long white beard). Love At The Hacienda also impressed the ears of Chappell Music's Kip Trevor, and Graham signed a songwriting deal with the publishing company in 85. To promote the LP , Graham had performed live at Manchester's International Club, The Gay Traitor Bar of the Hacienda nightclub itself, and at London's Rock Garden. However, just as Graham's own music was attracting attention from major record companies, he invented another alter ego - ex security guard and versatile singer/organist, John Shuttleworth, from Sheffield, South Yorkshire. Created initially as a joke to befuddle staff at Chappell Music where Shuttleworth-style audio tapes were popular and regularly circulated, the joke soon backfired (in a nice way). Excited by the new character, Graham's own songs were immediately sidelined and new Shuttleworth material eagerly sought by Chappell Music, who circulated the tapes as if John was a genuine wannabe. Shuttleworth soon garnered a cult following which included pop bands The Lemon Trees and Dodgy whom Shuttleworth later supported, as well as (bizarrely) Jonathan Richman on a UK college tour in 88. Throughout 86 and 87 Graham made live appearances as John Shuttleworth, usually in small rock venues in London. At that time John's organ playing was mimed (whilst a prerecorded keyboard track was played from a tape recorder hidden beneath a large wooden Farfisa model) and a collection of plastic snakes, clockwork dogs and robots 'performed' on the top of the organ as John sang. The numbers amused and bemused heavy rock fans as they waited for the main act of the evening. These toys were, as John would proclaim to his audience, "Visual stimuli, because I'm a bit boring to look at after a while. I am, I accept that". Shuttleworth even supported Robert Plant in an invite-only gig to promote Plant's new LP at London's Marquee Club on Wardour Street. Family bereavement and the death of a beloved pet dog in the Spring of 87 brought Phase 1 of John Shuttleworth's career to an abrupt end, and after some serious navel gazing, Graham decided that what he really wanted to do in life was.. be a milkman! Initially Graham had applied to Express Dairies in North London, (where he was now living, in the Alexandra Palace area), but Graham was turned down by the dairy, and this so affronted (and slightly embarrassed) Graham that he immediately applied to be a milkman at the Co op. This time Graham was successful and eagerly embarked on a four week induction course, under the tutelage of a man who claimed to be the brother in law of model, Linda Lusardi. Interestingly, a track on Love At The Hacienda, 'Sorry Samantha' name-checks the former page 3 favourite..
And Samantha Fox was getting very cross! No, no, no, I'm sorry, Samantha..
Graham's career in milk delivery was cut short when he was offered the part of Geoffrey in a revival of the classic play A Taste Of Honey at Manchester's Royal Exchange Theatre. Then followed a year of acting in various plays at the New Vic Theatre in Newcastle Under Lyme. However, when he should have been learning lines, Graham often found himself composing new songs for John Shuttleworth, or planning audio tapes for the character. Phase 2 of John Shuttleworth's career had begun, and as a result of his recent immersal in the world of theatre, Graham's approach to the character was decidedly more theatrical than previously. Drunken heavy rock fans no longer seemed a likely audience for the subtler, more complex character Shuttleworth was becoming. Encouraged by a new fan and mentor, part time impresario Steve Finan (comedian and quiz show host, Tom O Connor's son - yes, really! ), Graham began attending alternative London comedy shows to study how Shuttleworth might be best presented. Throughout 1991 and 92 Graham performed the character at comedy clubs like the Red Rose in Hornsey, the Kings Head in Crouch End and the Chuckle Club on Carnaby Street. It was there that comedy agent Richard Bucknall first saw John Shuttleworth perform and invited Graham out for lunch to discuss sole representation. It turned out to be only a cheese sandwich and Graham was so impressed by the fellow Yorkshireman's parsimoniousness that he signed to RBM Comedy on the spot! In the late 1990's, with John Shuttleworth's popularity still growing, Graham decided to create a new character; Birmingham-born multi media lecturer and embittered rock performer, Brian Appleton. The initial impetus for the character came from two sources: 1. the amusing vocal delivery and mannerisms of a friend, Chris Phipps (himself a real rock musicologist and pop music researcher), and 2. a realisation by Graham (during a discussion at a friend's barbecue) that he didn't know the difference between Ben E King and BB King, and indeed knew very little about the history of popular music (apart from the UK chart positions of Summer 78!). Graham began studying Rock n Roll history books, but soon saw the dramatic possibilities of weaving Brian's own fictional history into the true life stories of famous rock musicians, whilst imitating the amazing Chris Phipps (with Chris's full knowledge and blessing!). Brian Appleton's History Of Rock n Roll made its debut at the Edinburgh Fringe Festival of 1999 and over the next decade led to three more UK tours, several Radio 4 series and a Christmas special. "This guy sounds like a idiot to me. Morrissey does steal some lyrics from books and such but this guy saying that Morrissey was outside his window is just plain stupid. If this guy is good enough for Morrissey to steal from, then how come he is not a famous rock star. The history of rock and roll obviously doesn't include him." Despite full houses and encouraging press reviews, comparisons were inevitably made between the life affirming, fully rounded character of John Shuttleworth and Brian Appleton's bitter demeanour and less developed persona. Brian Appleton never reached the dizzy heights Fellows had hoped for, and the sheer time and effort involved in researching his shows has made Graham pop him on the back burner for now. But here's a taste of the great man just to annoy those outraged Morrissey fans.. I said "Get out of bed, you're better now surely! It's my turn to be infirm. Where's my Anadin, you lazy haradin?" Meanwhile, perhaps keen to try and keep up with Steve Coogan in whose TV series, Coogan's Run, Graham had recently made a guest appearance (as Clement in 'Mike Crystal'), Fellows created yet another comic character. Dave Tordoff is a brash though well meaning builder from Goole, East Yorkshire. Dave performs "laser screeding", a modern type of concreting, the name of which so amused Graham when he saw it written on the side of a van one day, that he made it Dave's speciality. Dave - as he was keen to tell his audience - was doing very well, earning "in excess of £5K a week!" Tordoff supported both Shuttleworth and Appleton on several tours from the late 1990s, and finally in 2005 appeared in his own stage show, Neighbours From Hull. However, when Graham suffered memory loss midway through an Edinburgh Fringe run, he pulled out of the festival and hasn't performed the character live since. Graham's fascination with the Shetland Isles - he had performed a John Shuttleworth gig there in 2000 and even made a movie about the place called It's Nice Up North - led him inevitably to the slightly less remote Orkney Isles where he bought a derelict church in 2008. With grant assistance this was restored and converted into a recording studio and refuge for artists (and other troubled souls). Graham also bought a sailing dinghy and - to keep it safe from the harsh Orkney climate - recently erected a boathouse by the shore. Unfortunately the boat is slightly too big to go in the boathouse (shades of Robinson Crusoe?) so is currently sitting forlornly outside. I know - can you believe it! But since Graham started doing Headspace on his iPhone he has become wise and philosophical, and is able to see this dreadful gaffe as a portent: that he should stop wasting time building boathouses and dreaming of life at sea (he hasn't even learnt how to sail yet!) and use his wonderful studio to record an album of new songs. And so that is what Graham has done - his first solo record since 1985 which was released in early 2018 in time for his first live tour as himself. Completely Out Of Character toured the UK throughout 2018. But Completely Out Of Character doesn't mean Graham's characters are being hung out to dry. Far from it - they will be back! Indeed, a Jilted John UK tour to mark 40 years since the single was a hit took place in Autumn 2018, and there are rumours that John Shuttleworth hasn’t put his Yamaha away forever... In the meantime, Graham is splitting his time between Louth, Leicester and Orkney with his partner Miriam Holland, and still hasn’t finished messing about with that boathouse. Thanks for listening.